1.1 - Treeview at left shows the organizational set up in hierarchical style, department-wise, as per chain of command, while the adjacent subform at right displays the same information in conventional style. 1.2 - Name of employee in current row of subform is highlighted in light green. Name of top boss for this employee is highlighted in light maroon while all intermediate superiors in the chain of command reaching up to current employee are highlighted in light orange. 1.3 - In synchronization, corresponding nodes in treeview (current employee, top boss and intermediate superiors of current employee) get highlighted in colors matching those in 1.2 above. Any employee node can be moved to another employee or department node. The resulting change in command structure gets reflected promptly in the treeview as well as the subform. If an employee node is dragged to empty space within treeview control (instead of specific destination node), a new department gets added, with the dragged employee designated as top boss in that department. 2.1 - Treeview at left displays classes and students while the adjacent treeview shows subject-wise grades for current student. 2.2 - Subject-wise grades can be entered / edited conveniently just by clicking the pertinent check boxes. 2.3 - For convenient viewing, as soon as a given class node caption is clicked or navigated to (say by Up / Down arrow keys), it expands, displaying all student nodes belonging to that class. Simultaneously, all other class nodes get collapsed. Note: For editing the label caption for employee or student nodes in the above treeviews, select the node by clicking on its label. Thereafter, click again so as to make the contents editable. (a) Match field values having any of search words. (b) Match field values having all of search words, but not necessarily in the same order as entered in search box. (c) Match field values having all of search words, in the same order as entered in search box. (d) Exact match of field values against full contents of search box. As the user types into the search text box, equivalent criteria string gets displayed at bottom of form. Simultaneously, the total number of matches found across the data source gets displayed. (b) Light Green: All other records having a match in any column. Various search options are selectable via an option group. Appropriate command buttons enable the user to find the first or next matching record as desired. A special subroutine ensures that the found record gets displayed at mid-position of the subform window. In order to facilitate efficient use of FindFirst / FindNext methods of a recordset, different data columns are stacked into a single master column through a union query. This temporary query, generated in form's load event, is devised in such a manner that different fields of a given record appear as a set of contiguous single field rows. These sets of rows (a set representing one original record) follow the prevailing sort order of form's record source. This is achieved by using sequential numbers for records (as per their prevalent sort order). Within a given set of rows representing an original record, the sort order is based upon tab index of respective bound controls. (a) While building the union query, care is taken that only visible bound controls (or unhidden columns in case of datasheets) are included in its output. (b) For insertion of sequential numbers, conventional approach, using a subquery or recordset based function can prove un-acceptably slow for large data sets. In this sample db an exceptionally fast method using incrementing variable, with values stored in a collection, has been used. This is based upon the technique kindly suggested by Gustav Brock. Since values displayed by such a method tend to be volatile on navigation through normal query output, a temporary table has been used for holding the values. (c) If the current record has more than one field matching the criteria, it will take that many extra clicks of FindNext command button to move over to next record having a match. This sample illustrates how to create a Previous Date query. 2) Display the previous date in subsquent records of a table over a group. There are two methods shown here: Using 1) a correlated subquery and 2) the DMax domain aggregate function. The correlated subquery is the faster method, but it returns a non-updateable recordset. The DMax method is slower, but the recordset is updateable. What is the difference between HAVING and WHERE in Aggregate Queries? Just today, I ran into one of the best explanations of the differences between the HAVING clause and the WHERE clause in aggregate queries (or Totals queries as they are called in Access). The WHERE clause is evaluated before the AGGREGATION/GROUP formation, while the HAVING clause is evaluated after. since the aggregation does not exists, yet. what will be 'c' in the HAVING clause? (a) Solution based upon VBA code in report's module. This does not call for any interference to report's record source. 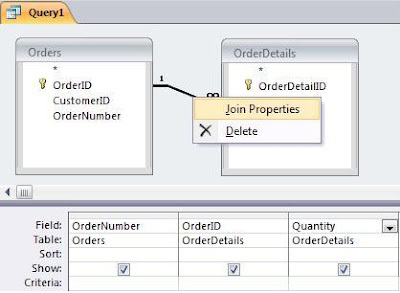 (b) Solution based upon SQL of report's record source, minimizing the need for VBA code. 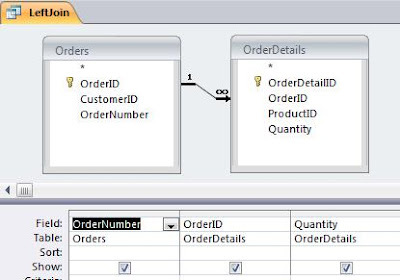 SQL based solution as per (b) above makes use of a driver table having a single field populated with sequential numbers from 1 onwards. This sample db demonstrates printing of labels in such a manner that starting position of first label as well as different number of copies for each label can be specified by the user. Out of available source data, only the labels selected by user will actually get printed. The report used for this demo has three columns. (a) Everything is managed via VBA code. No interference to report's record source is needed. (b) The query serving as report's record source is devised in such a manner that it takes care of specified start position for first label to be printed as well as different number of copies for each label as desired. VBA code is minimal, just for hiding the label control when blank. Method (b) above makes use of driver table T_Ref having a single field RefNum populated with numbers 1 to 200. If the number of copies for any label are likely to exceed this number, contents of table T_Ref can be expanded suitably. Source data consisting of three fields holding top middle and bottom lines for the intended label, is displayed in a subform along with a column displaying the desired number of copies in each case. The last column has bound check boxes enabling the user to select which of the labels are to be printed. Sample label pertaining to current record in the subform is displayed on the parent form. Any editing of contents in the subform gets reflected promptly in the sample label. You can see that there is an OrderID "4" in the Order table. However, there are no records for OrderID "4" in the OrderDetails table. Thus, OrderID "4" does not appear in the resulting Inner Join. But there times when you want to show all of the records of one table and the associated records in another, whether or not all of the records in the first table have a match. This is called an Outer Join. In Access, there are two types of Outer Joins, Left Join and Right Join. The Left and Right refer to which side of the equal sign the table is on in the JOIN clause. I'll get back to that in a minute. The "Left" and "Right" handedness doesn't really have anything to do with the table positions in the Query Builder. It has more to do with the positions of the tables with respect to the JOIN keyword. Since it is joining only matching records, it doesn't matter what order the tables appear in the clause. But to create an Outer Join, you have to indicate which table will show all records. In Access, you do that with LEFT JOIN and RIGHT JOIN. In a Left Join, the table on the left of the JOIN keyword (Order) will show all records. In a Right Join, the table on the right of the JOIN keyword (OrderDetails) will show all records. 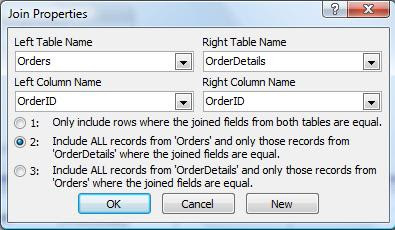 An outer join (left or right) can participate in a multiple table join only under circumstances. If the query also involves an equi-join and certain outer joins, it will result in the Ambiguous Outer Join error. For more information about this error, see my post: What is an Ambiguous Outer Join? One last thing about Outer Joins: Earlier, I discussed creating an Equi-Join in the Where clause, but as far as I know, in Access you can't create an Outer Join that way. Next time, I'll look at a specific application of the Outer Join: the Unmatched Query.